Last Sunday (17th January) was typically Irish. It rained without letup from dawn to dusk, I had a famed breakfast baguette and I finished with a pint of Guiness in Cork airport before departure back to London. 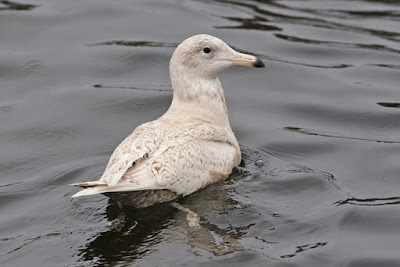 In between, I threw a few loaves, saw a few gulls and got thoroughly soaked to the skin. 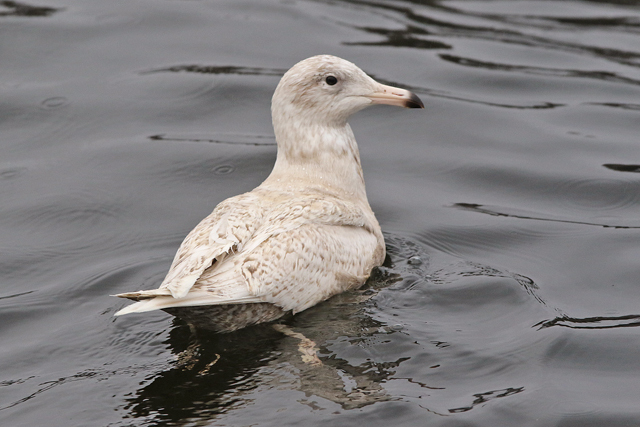 Star of the show, and the reason for driving overnight from Wexford to west Cork, was the adult Glaucous-winged Gull in the harbour at Castletown Bearhaven. Although the streetlights were still on in the gloom at 9am, one slice of bread was enough to bring this Pacific monster into view. Being honest, it wasn't as much of a beast compared to the many I've seen on the US west coast (in California, Oregon and Washington) or Japan just a few weeks back. 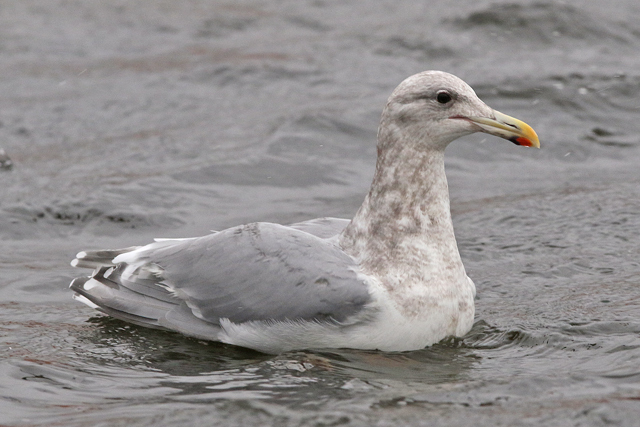 Hanging around among predominantly first-winter Herring Gulls, it even got a beating from them. Swarthy looking too, with the mantle a shade darker than the accompanying adult Herring Gulls and the primaries at the darker end of the spectrum for the species. A long, parallel-sided bill also. 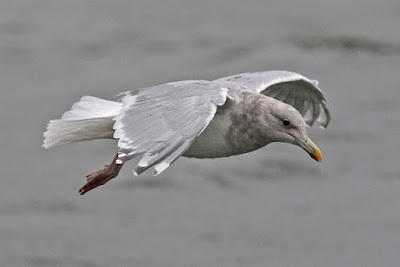 A few dissenters from the other side of the Atlantic, but on the whole I reckon I've just about managed to put that square peg into that round Glaucous-winged hole. Just. 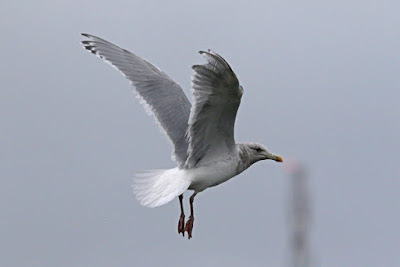 As I awoke in the half light (after a very fitful night's sleep in the car), I saw a juvenile Iceland Gull by the fish harbour on Dinish Island - almost forgot to mention that, given how regular they are out in Cork. 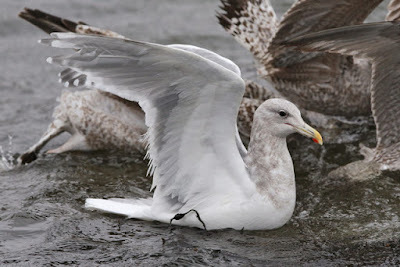 Anyway, having had my fill of the Glaucous-winged Gull and needing to dry off I headed back east. West Cork is a place I know quite well from previous Irish winter trips, and with no previous luck at Glengarriff, I chucked out some bread as a token gesture. And out of nowhere, at a site that is pretty marginal to say the least, in came a showy juvenile Glaucous Gull as well as a 2nd-winter Iceland Gull. Job done, happy days etc. Onto Bantry where a ringer is usually a dead cert. 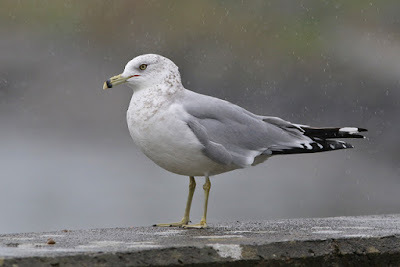 And in totally heinous conditions, bread was flung and in came an adult Ring-billed Gull. In all seriousness, I can't remember many days where the rain was that continual. 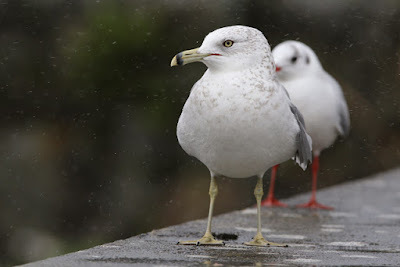 It actually stopped me getting out of the car at Ballydehob and Schull, while at Baltimore the foul conditions meant that my searching wasn't as thorough as I wanted it to be. The same went for Union Hall, Rosscarbery and Clonakilty where a flock of 35 Magpies were the 'highlight' in the grim conditions. It was early back to Cork airport for the mid evening flight, and a well deserved pint of Guiness. That Sunday was my first time in Ireland, the rain was truly Biblical Richard, but the G.W.Gull was worth it!